A little girl is having a tea party in her yard with her dolls and her stuffed animals. She is giving her "guests" some popcorn for a snack when Jack the dog arrives on the scene. Jack would love to have some popcorn too and the little girl gives him a piece. But, as everyone knows, one piece of popcorn is never enough, and Jack really wants some more. Jack begs the little girl to give him some more but she's not going to give in. Firmly she removes Jack from the vicinity of her tea party, but when her back is turned another uninvited guest decides to sample the popcorn. What are Jack and the little girl going to do now? Little children who want to 'read' books on their own will be thrilled with this title because they won't need to ask an adult or older child to read the story to them. 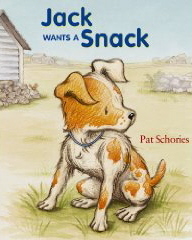 Without any words at all Pat Schories tells a delightful tale about a young dog who knows, unequivocally, what he wants. Pat Shories' warm and expressive illustrations capture Jack's hopes and the little girl's determination to perfection. This is one in a series of wordless books about the adventures of Jack. Pat Schories is well known in the children's book world for being the creator of Biscuit, another dog who has plenty of personality.